Ferret Care - Welcome to Critter Camp! Ferrets are reportedly the third most popular non-caged pet, directly behind dogs and cats in U.S. households. The ‘non-caged’ part may surprise folks. However it is vital to ferrets’ well being that they not spend the majority of their time inside a cage. A caged ferret quickly becomes agitated, bored and depressed. This stress may lead to behavioral problems such as biting, making owners less inclined to play with their ferrets, and thus increasing their behavior problems. 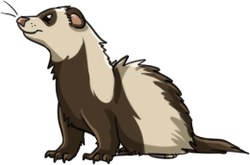 Ferrets are members of the weasel family and are related to skunks too. They are born with a scent gland very similar in function to a skunk’s for use as a defense in the wild. All ferrets in the United States must be descanted and spayed or neutered before being sold as pets by law, so you won’t get sprayed by a ferret. However they do still retain a musky smell that some people find quite unpleasant, yet others actually like. The odor comes from oils secreted onto their skin. Bathing them often will only increase the oil production and make them smell worse! So you definitely need to be sure you like the unique aroma of ferrets before you acquire them. Ferrets are highly social animals and are infinitely happier and therefore healthier and better pets when kept in groups of 2 or more. Ferrets are kind of like kittens mixed with puppies mixed with lots of caffeine. They are high speed rompers and wrestlers their entire lives, up to 9 years. However they also sleep several hours a day too. The ferrets we have as pets here in the U.S. are European ferrets that originally were bred in captivity to hunt rabbits and other rodent prey for royalty. Therefore their instinct to hunt is very strong and it is not advisable to keep any prey animals (even in secure cages) in the same room as ferrets. Just the scent of the prey animals (such as hamsters, gerbils, mice, rats, rabbits) can cause the ferrets to be aggressive and ‘on the hunt’ all the time, not to mention what will happen once they get their nimble little paws on those cages. Ferrets are ‘obligate carnivores’ which means that they are strictly meat eaters in the wild. They need a very high protein diet consisting of a good quality ferret food, such as Totally Ferret. Contrary to popular belief they cannot live on cat food or dog food. There is not enough protein in either. The ferret may seem alright for a few years but then will develop any host of problems including insulinoma, kidney disease, and adrenal disease, if not given an appropriate diet. These are all life threatening and chronic conditions. Many of the rescued ferrets we take in suffer from these due to years of poor diet and living conditions, as well as bad breeding practices. Ferrets are known to enjoy sweets and dried fruit, such as raisins, but these are not good for them at all and can contribute to the serious health problems mentioned above. It is best to just not get your ferret started with these treats. Use the ferret specific high protein treats available commercially such as Bandits, instead. The ideal situation is a dedicated ‘ferret room.’ This is a room that is ferret-proofed: outlets covered, cords secured out of their reach, vents and ductwork covered with screening, window screens reinforced, good heat and ventilation, and regularly checked for any potential hazards. Ferrets are escape artists and can get around, through and under almost anything! A good rule of thumb is they can squeeze through any opening that they can stick their head in. They should also have a large multilevel cage with hammocks, hideout blankets, snuggle sacks, litter box, food dishes and a water bottle where they can be secured safely when you are gone from the house or asleep for their safety. Ferrets can get into many dangerous situations due to their curiosity and ability to squeeze through small openings. Unfortunately many ferrets have been hurt or killed after getting inside of recliners, appliances, etc. as well as slipping outside when the door opens. For these reasons it is not advisable to let the ferrets have the full run of the house, and to only have one specific room set aside for them. Place several litter pans in the ferret room in the corners and they will use them about 75% of the time. Ferrets are never totally potty trained, so expect to clean up after them regularly. Because they have a very high metabolism they need to have access to food and water at all times, and they need to eat about every three hours at least. They will also only eat as much as they need, so it is not necessary to ration their food, just have some available at all times. Due to their fast digestive system they also defecate and urinate about every three hours. It is pretty smelly stuff too. (Interesting fact- well interesting for us animal folks anyway- the more carnivorous an animal is the more its poop stinks!) Keeping ahead of the potty issue is a constant chore. As far as types of litter, pellets are the most highly recommended. The cheapest source for pellet litter is to use home heating wood pellets. A 40 lb bag costs about 5$ at hardware stores. Availability in the summer can be a problem, however. As a back up, Yesterdays News type cat litter works well, and there is actual ferret litter made too but it is expensive. Clumping or clay cat litter is not recommended as it can harm the pads of their feet and be ingested with their food, causing blockages. • Play war dance with them – pat your hands on the floor in front of the ferret like you are coming after him - he may hop up and down and side to side. • Obtain a ferrets harness and leash of appropriate size for your ferret, fasten securely, and take them for a walk out in your yard. They will love to smell all the exciting new scents, slither through the grass, and dig in the ground. Watch them closely because ferrets have been known to wiggle out of a snug harness. • Let your cat or dog interact with the ferrets in their room, briefly under direct supervision. When they can get along they will have a lot of fun wrestling and romping together. However some cats and dogs will not play nicely with the ferrets, or the other way around too, and then you must separate them immediately. Also remember that the ferret food is very rich and cats and dogs should not eat it while in their room. • Give them a dig box- ours is a large low plastic sweater storage container with a lid. The lid has 2 ferret size round holes cut in into each side and we filled it with dried pinto beans. The ferrets can slip in & out and use their natural instinct to dig without making a big mess. Amazingly our ferrets have never used the dig box as a litter box, and it stays very clean. Sadly many people are not prepared for the downsides to ferret ownership, consequently now there are thousands of ferrets in shelters needing homes. We are currently caring for 20 ferrets here at Critter Camp that are here for sanctuary. *Please note that the information given is that which we have gleaned from years of caring for the animals, as well as consultation with many resources and experts; and is not intended to replace other professional advice. Medical issues need to be brought to the attention of your veterinarian immediately. *We do not accept wildlife at Critter Camp. Please contact a licensed wildlife rehabilitator if you find a wild animal in need of assistance. * Learn everything you can about the type of animal you want to get. * Know where you will live and what your income will be for the entire life span of your pet. * Think about what you want to do with your pet and how much time can you honestly spend with it every day? *Visit someone who already has the type of pet you are interested in and spend some time with that pet. * Be tested for animal allergies. Try www.petfinder.com - Be sure to check the “Classified” Section too!